Kaufmanniana are one of the earliest flowering tulips varieties! Also called "water lily tulip" because the petals open in the sun and then close again. A mix of wonderful shades and colours to brighten up any garden, Kaufmanniana are one of the earliest flowering tulips. Also called 'water lily tulip', their petals open up in the sun and then close again, just like a lilly on a pond. 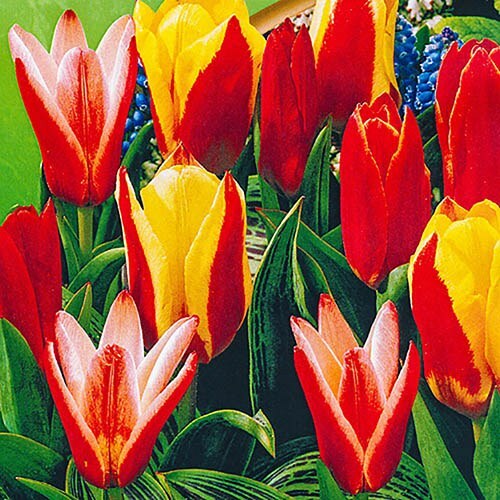 Tulips are one of the most popular spring bulbs as they are perfect for planting in a mix with many different colour variations to give fresh, vibrant spring colour to your garden, patio or decking. They also make great cut flowers to brighten up the house.